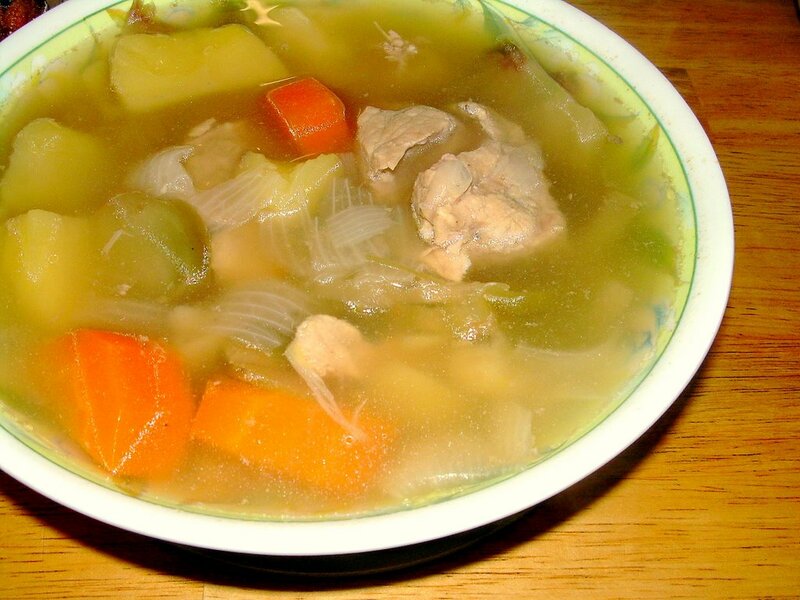 There is a famous soup called ABC Soup which is essentially a combination of cubed potatoes, carrots, tomatoes and onions cooked in meat stock (usually pork or chicken). After my posting on Hot and Sour Szechuan Vegetable Soup recently, Tummythoz, girlgirl and tekko informed me that they add carrots and even corn into the soup. That was new to me. So, when I went home to my mum’s place last night, I was most surprised to see a bowl of Szechuan Vegetable Soup which has carrots, onions and potatoes in it! It is indeed a marriage of the Hot and Spicy Szechuan Vegetable Soup with the famed ABC Soup! And true enough, it has the hot and sourness of the szechuan vegetables and the sweetness of the ABC soup. I shall call it the A B C D Soup then! It is another one of those simple-to-cook yet appetising and nutritious soup which is great on a cold weathered day! This is the recipe for A B C D Soup. i don’t know what szechuan vegetable is. is this ham-choy (sour green mustard? )and where can you get this? rose : Hello rose! No, szechuan vegetables are not the same as sour green mustard though I suspect they are from the same vegetable. Ham-choy, as you rightly said being the sour green mustard, is preserved salty whereas szechuan vegetables are preserved in a spicy yet salty marinade. It looks like a huge round chunk of vegetable stem. Depending on where you stay, your best bet would be at a chinese market or grocery store. well… yesterday my grandma just boil this soup. she will boil this soup every 2 or 3 weeks once n for 3 to 4 hours long each time.. usually after 2 hours she will turn it to low heat… n for d ingredients she will put pork or chicken bone for a better taste, n then if u guys could tolerate hot/spicy? then when boiling u can add pepper (in a seed form) in it, (is d spirit of this soup)… and do u know? the leftover soup is more yummy. but of course after u stir it and u planning to drink it tmrw, u must heat it back and after it, open d lid to let it cool n close it back, if not d soup will turn out bad tmrw. d szechuan vege u can choose to add it or not also can (but i’m not sure la… coz never do it myself. ) just peep d leftover (me haven’t wash the pot yet )she also put red dates in it…n forgive me for this long post..
beside the difference in the ingredients used in preserving, they are 2 different type of mustard greens. The vegetable used to make szechuan vegetable has a big knobbly stem. Only the stem is preserved, the leaves are not. In Shanghai, they are known as zha cai (ie compressed vegetable).